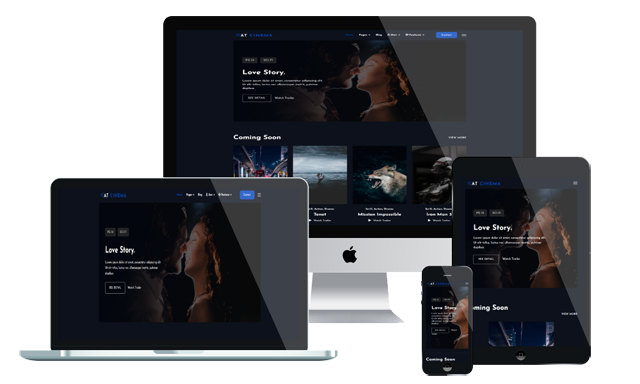 AT Cinema is a modern and fully responsive Entertainment Joomla Template designed especially for traditional or online cinemas to show off themselves in a beautiful way on the Internet. This theme has a strong base on the powerful framework with completely Bootstrap CSS Framework, Support Font Awesome, K2 extended style, as well as tons of widgets and modules available within your CMS panel, AT Cinema will be a potential supporter for you to make your business come closer with customers with its attractive and user-friendly look. Besides, this theme provides your site with a fully responsive layout, appearing wonderfully on any kind of mobile devices in a modern and stylish way, with proper content organization. Especially, in order to make your site more powerful, we have integrated it with J2store – one of the best shopping cart solution for Joomla and JEvent which helps you to host and manage all the events on your site conveniently and efficiently. It is also easier for you to edit AT Cinema as the way you want since it is fully customizable. Save your time and money today and build a great appearance for your business now!